hump with an edge that grips the tire. Designed to be strong and energy absorbent. 1, 2, 3, 4 or 4 1/2 inch offsets. Weighs approx. 19 lbs (non beadlock). 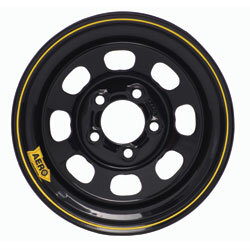 AERO's 15 x 8 Beadlock Wheel is I.M.C.A. approved and is the most widely used wheel in this association. AERO Beadlock wheels are a true 8". We manufacture special rims for our Beadlock Wheels, avoiding runout problems caused by using a torch or plasma cutter to trim rims to size. Inner and outer beadlock rings are CNC laser cut to insure consistent quality and accuracy on every wheel. AERO's Beadlock Ring uses (16) grade 8 zinc-plated bolts and washers. Mud cover tabs are cut directly into the inner ring, eliminating the need for welding. Prices shown are pickup only. Please email for approximate shipping cost.